I had not planned on watching the Star Wars trailer let alone 3 times. I knew exactly what would happen as soon as I got that play button, but the masochist inside couldnt resist temptation. Especially not when I had been messaged it was going to be played during the NFL game, not when friends were posting on my Facebook claiming Rey was evil. The last one I wasn’t even sure was credible information or a friend pulling my leg especially as she hadn’t even seen all the movies. The need to know consumed me. And so it began. 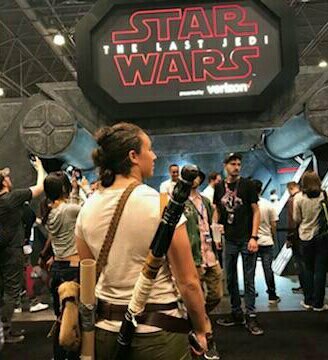 How much of what we saw is Rey”s force vision and how much is real? Who needs to fulfill their destiny? What is their destiny? Destiny in previous movies was about bringing balance to the force. That line has been stuck in my head since the first trailer came out monta ago. That word has a dual meaning. There is Jedi as in the Jedi order and Jedi as in the Jedi philosophy. As demonstrated by Luke and the fact that there wasn’t a Jedi order during his lifetime, the two aren’t mutually inclusive. When Luke tried to reestablish the Jedi order, the Knights of Ren came and slaughtered his students. So no Jedi order. This leaves the Jedi philosophy. Brief disclaimer – I am not currently up to date in the Extended Universe (EU) as I wish I was as in still reeling from the impact caused by Disney shattering the previous EU, turning that into legends and creating their own EU – that’s a whole other rant. Something from ‘Legends’ that has stuck with me is the philosophy a group of monks Jacen Solo encountered during his journeys. Their interpretation of the force was not that it was black and white, instead it was multicolored, neither good nor bad. This is my favorite interpertation of the force. There needs to be a recognition of the force as a whole, not divvied up by the boundaries determined by Jedi and Sith. I think this is what Luke means when he says the Jedi must end. It is now an archaic philosophy. There’s a whole lot more rant where that came from but I can pause my ramble for a hot second and not be ever-consumed about what’s going to happen…at least for a little. So let me know what you think, if you completely disagree with me or just think I’m flat out crazy.